Robert Heinlein wrote a few times about the “Crazy Years” which he plotted pretty much where we are now. He didn’t go into much detail, besides off-hand mentions of the general collapse of nations and civilization and all the things that go with it: war, famine, riots, looting, you know, all that stuff that we’ve been without for a very long time. I’m talking about serious privation, not the sort of distant wars we’ve seen since WWII… real, genuine hard times. In David Weber and John Ringo’s Empire of Man books, they mention the Dagger Years, a similar time of chaos and bloodshed. Looking out at the world and internal to our country, I’m worried that we’re headed that way. There’s too much rhetoric and finger-pointing and no one really wants to fix these problems. Problems, after all, employ people in the progress of fixing them. The bigger the problem, the more people will allow “temporary” measure to repair them. I feel like the US has run out, chasing the road runner… only to find ourselves running on empty air. The rest of the world, is watching, some of them hoping for us to fall and others are encouraging us to keep running, insisting that we’ll find solid ground under our feet soon enough. Meanwhile, here we are, the average person, starting to watch the ground approach. How we got here isn’t important right now. The important part is putting together some way to actually prevent that impact with the hard edge where ground meets sky. I’m increasingly coming to the opinion that we can’t avoid that impact. 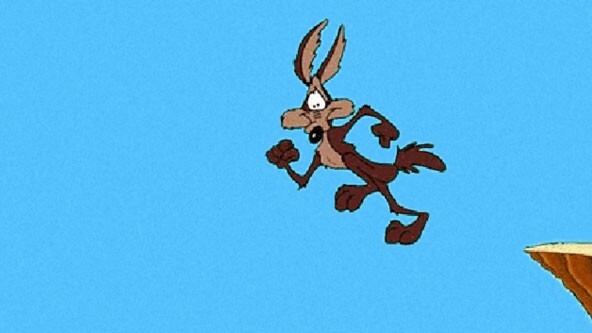 In fact, it sometimes feels like Wile E Coyote’s rocket boots are running us full blast towards the ground. People on all ends of the political spectrum are madly cackling as they pile up dynamite to cushion the fall, and, yes, someone has replaced the parachute with an anvil. Where am I going with this? Well, it isn’t all doom and gloom. We’ve got enough people trying to rein in the crazy that we might just pull out of this death spiral. What we need to do is start being rational. Anger, hate, these lead to the dark side, yes? We’ve got to stop looking for simple solutions and smooth-talking liars to fix things for us… we’ve got to fix things ourselves. Be the example for your friends and neighbors. Teach your kids the importance of hard work and independence. Walk with your head high and be not afraid. Fear is the mindkiller. Speak your mind and most importantly… listen. Communication has always been the ally of those who want control. Don’t give up. Don’t ever give up. Do not go quietly into the night. Rage, rage against the dying of the light. Keep pumping those feet and maybe, just maybe, we’ll get across this empty space to the other side. 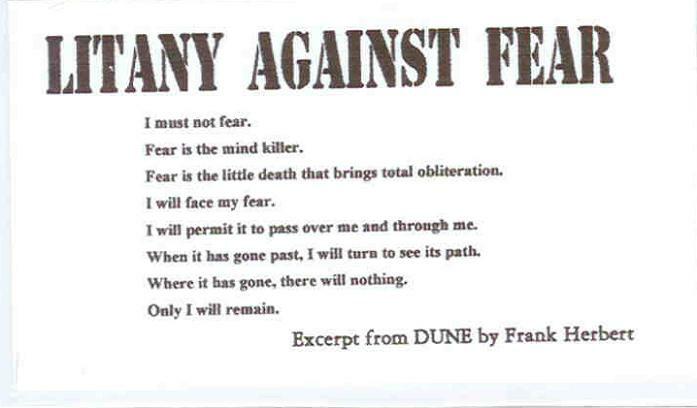 I remember reading Frank Herbert’s Dune as a child and being at once excited and awed by some of the concepts. One of the big ones, one of the ones that stuck with me, was what I remember as the “Human” test. Basically, you stick your hand in the box and the box gives you excruciating pain… while someone has a poison needle against your neck. The test was simple: pull your hand out of the box because of fear and pain and you get a needle in the neck and die. The whole point of this test was to find who could overcome fear and pain, to rise above their animal natures. It sort of fit with a lot of the metaphysical ideas that went around during the time, the mind over matter mentality. What bothers me, I suppose, is the underlying assumption that you have to prove yourself to be human. It is an uncomfortable thought, when you dig into it. How does one prove something like that, after all? Even in Dune, the test is shown to be subjective as the Bene Gesserit who gives it to Paul Atreides admits to herself that she tested him far more harshly than she planned. The worst part, I think, is that if you accept this test in concept, you then create people who, strictly speaking, aren’t “people.” If you have some arbitrary test that separates them, then you dehumanize everyone who doesn’t pass your test. They become human-shaped animals… and whenever someone does that in history, bad things tend to happen. When you draw lines in the sand, when you go beyond separation of “us” and “them” and into “human” and “subhuman” you start creating some very dangerous circumstances. Humanity, as a survival mechanism, tends to think in social groups as “us” and “them.” It is a mechanic of social trust and community. To an extent, you can’t break us of our tribalism, we all feel the need to identify with something. We all feel the need to fit in, to conform (even if you identify with the ‘counter culture’ you’re still conforming, just with a different social group). In these circumstances, any method of success is considered justifiable. Normal people don’t consider a mouse as “owning” land or property, nor, when they have allowed themselves to consider “them” as human-shaped animals, do they bother to value “them” as having a claim on life, liberty, or property. So why the lengthy explanation and what does this mean? I look out on the interwebz, and I see a lot of fear. I see a lot of anger. I see people in their social groups rationalizing why their opponents aren’t logical, because they disagree. This is, I’m afraid, human nature. We’ll continue to argue and disagree as long as we exist. What I also see, however, is the denigration of “them.” It comes from that anger and fear, the uncertainty over the times. When people begin to tell themselves that they know better, that they know what is right, their next step is to believe they are right because they are superior… because those who disagree with them are less than human. The ugliest part of this is that it robs us of our humanity on both sides of these kinds of divides. To treat our opponents as human-shaped animals is to open a door to unspeakable horror. What’s the solution? I can’t say. I’m almost afraid that we are past the point of a solution. Anger, fear, and divisiveness are the tools of those who already think themselves “superior.” They’ll cheerfully put us at one another’s throats, because in their minds, they already know that we’re all just human-shaped animals who can be pitted against each other for their own benefit. Take some time, talk, listen. Put down the cell phone and get out from behind your computer. Talk to people. That’s the big thing, people don’t talk, they’re afraid to be grouped as “them” and cast out of their social group. Tear down the walls, discuss the things that you’ve been afraid to talk about and don’t be afraid to argue your point. Above all, treat everyone with dignity and respect, even if they don’t agree with you. Most of all: don’t be afraid. Fear is the mindkiller.